Today, Weta Workshop put up their most detailed environment yet. The Barad-Dur: Fortress of Sauron has gone up for order and after seeing this at Comic-Con just last month this is something fans will want to make sure to figure out how to get into their collection. Barad-Dur took the team at Weta over 1,500 hours to complete and when you get a chance to see this you will be able to see why. This environment is a perfect rendering of what was on screen and will take you right to the moment we first saw Barad-Dur on screen. 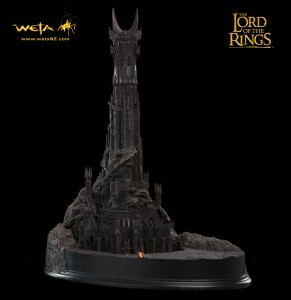 Barad-Dur comes in with a price tag of $699.99 and an edition size of only 1,000 pieces world wide which are sure to sell quickly. You do have time to save though as this environment will not be shipping until December this year or next January.